With glossy green leaves and rich red blooms, Anthurium is one of the most stunning plants to grow indoors. Also known as flamingo flower or painter’s palette, it will add a touch of luxury to an indoor space. Thankfully, anthuriums aren’t hard to care for and will thrive indoors when provided the right conditions. Before I go into detail, here’s a quick summary of its care. How to care for an anthurium plant: Anthuriums should be planted in well-draining, acidic soil, and kept in humid conditions at temperatures of 60 °F to 90 °F. Water infrequently but thoroughly once the top inch of soil is dry, and fertilize every other month through the growing season. Flamingo flowers will survive by following the simple advice above. But if you really want to let your anthurium thrive, read on and I’ll tell you how to get the most out of this beautiful plant. How Do You Water An Anthurium? Allow the top inch of soil to dry before watering an anthurium. Stick your finger into the potting mix about an inch and if it feels dry irrigate. Always water thoroughly until the water runs from the bottom drain holes. During the growing season of March through September, you can expect to water about once weekly. This gives the soil time to dry out before watering again. However, during winter when the plant goes into dormancy (growth slows), the anthurium will probably only require water about once every two weeks. The frequency you will need to water will depend on the individual conditions that you are growing your plant in, but you should get an idea of the pattern before too long. Don’t overwater or allow the pot to sit in standing water, as root rot can develop which can lead to the anthurium’s death. On the other hand, don’t allow the soil to completely dry out, which can also lead to problems with the plant’s growth and health. Does An Anthurium Need Humid Conditions? Native to the warm and humid tropical regions of Ecuador and Colombia and considered a tropical perennial evergreen in its natural habitat, anthuriums grow as an epiphyte, using the jungle trees as support. Therefore, it is only natural that anthuriums require a humid environment indoors for proper growth. Maintaining a humidity level of around 80 percent is preferred. You can easily create humidity for the plant by misting it with room temperature water every couple of days. Others options include using a humidifier or humidity tray. As I have quite a lot of houseplants, I bought a humidifier, which makes it so easy to maintain good humidity levels for my plants with minimal effort. To help maintain the much-needed humidity, don’t place your anthurium close to a heating system or vent that produces hot, dry air. What Indoor Temperatures Are Best For Growing An Anthurium? Being a tropical plant, anthuriums grow best when indoor temperatures aren’t too cold or too hot and maintained in the range of 60°F to 90°F (15°C to 32°C). However, anthuriums grow best when indoor temperatures at night are kept around 68°F (20°C) and around 86°F (30°C) during the day. 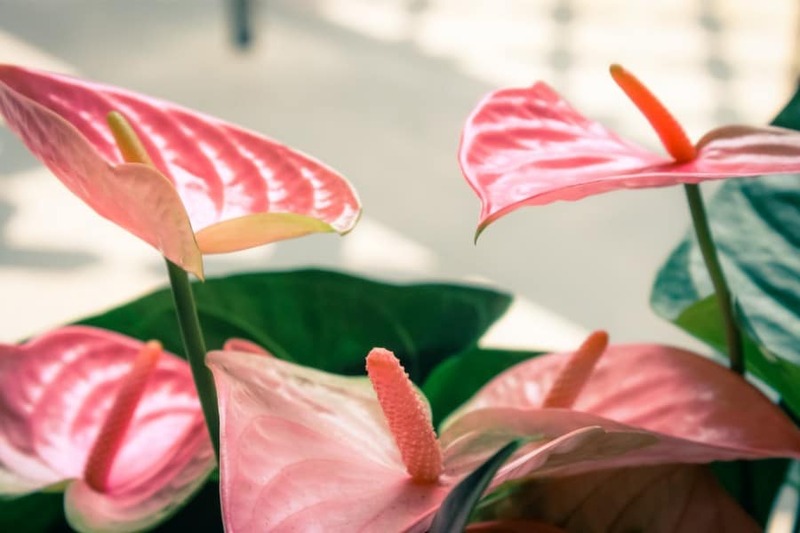 If you want to give your anthurium a break outdoors when the weather warms in spring, be sure to bring it back indoors when nighttime temperatures start dipping below 50°F (10°C) so it doesn’t suffer damage. How Much Light Does An Indoor Anthurium Require? Indoors, anthuriums thrive when placed in a location that receives medium to bright indirect light. However, during winter while the plant is dormant, they will tolerate receiving less light. Don’t place the anthurium in an indoor location that receive bright, direct light especially during the afternoon or the foliage can burn. It is good to remember that in their native environment anthuriums grow beneath tree canopies and are protected from the direct rays of the sun. What Are Some Problems With Anthuriums Grown In Improper Lighting? In addition to foliage burning when light conditions are too bright, when light conditions are less than ideal the foliage can also lose color turning paler. This can lead to you thinking it’s suffering a deficiency in nutrients and requires additional fertilizer, though it only requires more light. If light conditions are too low, the anthurium ceases producing flowers. Although anthuriums’ shiny green, heart-shaped, tropical foliage is attractive on its own and adds a blast of greenery to the home, the stars of the show are the plant’s waxy, heart-shaped bracts or spathes, born on long stems and blooming in a variety of colors. The spectacular bracts are actually modified leaves, rather than being the flowers of the plant. The true flowers are the tiny bumps that grow along the finger-like projection, called the spadix, which rise up from the spathe. The tiny flowers are just about the longest lasting flowers you can grow at home. What this means is that the spectacular elegance of the colored bracts remain for months at a time if cared for correctly. Do Anthuriums Flower Every Year? Anthurium flowers can last for more than three months and will produce new blooms all year round if given adequate light and care. Anthurium plants can live for years, and bloom again and again. They will produce fewer flowers in winter or if grown in a lower light location. How Do I Get My Anthurium To Bloom? Growing the anthurium in fertile soil that drains well. Using a container that has bottom drainage. Watering when the top inch of soil is dry to the touch. Ensure your anthurium is getting sufficient humidity. Fertilizing every other month with a houseplant fertilizer high in phosphorus and applying at half strength. Placing the anthurium in an area that receives bright to medium levels of indirect light during the day. Your anthurium is less likely to produce flowers if it isn’t happy with the conditions it is living in. Also very important to the production of flowers is making sure the plant is receiving enough light. If lighting conditions are too low, the anthurium won’t produce blooms. If your anthurium is happy with its growing conditions, is a mature plant that is blooming but just not producing an abundance of flowers, there’s probably nothing wrong with it and it’s flowering at a normal level of production for anthuriums. Understanding anthurium blooming habits will alleviate any unnecessary worries you might have that something is wrong with your plant. Mature anthuriums produce larger flowers and bloom more often throughout the year than immature plants. Even the best cared for anthurium plant produces an average of about six flowers each blooming cycle, so don’t expect your plant to be covered in blooms. The great thing about the blooms is they are long-lasting, staying colorful and perky for about 6-12 weeks. Even as cut flowers, anthurium blooms last about six weeks. Does An Anthurium Require Fertilizer? To keep your anthurium happy, healthy and to promote flowering, fertilize it every two months. Use a water-soluble blend with a high middle number, which is the amount of phosphorus the product contains that promotes blooming. You can apply the fertilizer when you water by using a half-strength blend and watering until it runs from the bottom drain holes. Fertilize while the anthurium is actively growing during spring and throughout September. Cease fertilizing in fall and winter, as the plant is in its dormant stage where all growth naturally slows. Do I Need To Flush The Soil To Remove Fertilizer Salt Build-Up? Although anthuriums aren’t heavy feeders when compared to many potted plants, the soluble salts in fertilizers can still build-up in the potting mix causing foliage burning. It’s a good practice to flush the soil every couple of months to remove salt build-up. This process is as easy as taking the pot to your sink and allowing water to run slowly over the soil and out the bottom drain holes for several minutes. Doing this on a regular basis assures any build-up of salts from the fertilizer is flushed from the soil. What Soil Does An Anthurium Need? Anthuriums grow best in coarse, well-drained, fertile soils with a pH of 5.5 to 6.5. You can make your own soil mixture by using equal parts of peat, perlite and pine bark and mixing them together. 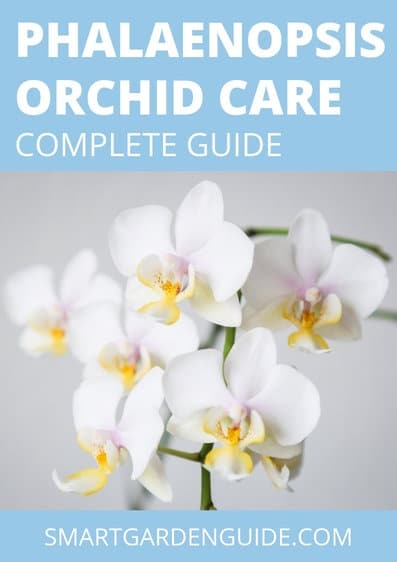 If you don’t want to make your own mixture, using a commercial potting mix or orchid mix also works well, but don’t use a potting soil because it’s generally too heavy and retains too much moisture leading to rot problems. It’s helpful knowing that in their native habitat anthuriums grow on tree branches in a mixture of moss and leaf litter, which is a breathable soil blend. How Often Should I Repot An Anthurium? Anthuriums only require repotting about every two to three years when it has outgrown its pot. It’s quite easy to tell if it’s time to repot because the root system starts growing out of the pot’s bottom drain holes or wrapping in a circular direction. How Do I Repot My Anthurium? If your anthurium is showing signs of outgrowing its current container, it’s time to do some repotting. Select a container that is slightly larger than the one the anthurium is presently growing in, as using a container that is too large, can mean the soil stays too wet, which can lead to rot problems. Make sure the new container has bottom drain holes and fill it about a quarter full of the potting mix. Gently remove the anthurium from its current pot, snipping off the roots growing out of the drain holes, if needed, so it pulls from the container without force, which can cause damage to the plant and the fragile root system. Place the anthurium in the new pot and cover with fresh potting mix, being sure not to plant any deeper than it was originally growing. Firm the soil up around the plant’s base using your fingers and water well. Situate the new container back where the plant was originally growing. What Type Of Container Should I Use For My Anthurium? Unless the anthurium you purchase is showing signs of growing out of its nursery pot, it should grow happily in the present container for another couple of years. However, if you want to repot into a more decorative container or it’s time for repotting, the biggest need in a new container is making sure it has bottom drainage to prevent rot. Any type of material works well for growing potted anthuriums from plastic to terra cotta, however, those grown in clay materials like terra cotta might need more frequent water applications, as the soil dries quicker than it does in plastic pots. If the anthurium hasn’t outgrown its present container, repot into one that is the same size. If the plant has outgrown its present pot, repot into one that is only slightly larger. Using a too large container can lead to the soil remaining too wet, which can lead to plant problems like rot. I double pot most of my indoor houseplants, and this works well for anthuriums. Choose a really well draining inner pot and place it into a decorative outer pot which has no drainage holes. This negates the need for a drip tray and adds to the beauty of your houseplant. It gives you so much freedom to choose a decorative pot to your liking. The only pruning anthuriums require is to trim off spent flowers and to remove dead or damaged foliage. When pruning, always use clean pruning tools so you don’t transfer any diseases to your anthurium. This is as easy as wiping off the blades with alcohol. Propagating new anthurium plants is easily done by dividing a mature plant in spring. Carefully and gently separate the root mass into multiple sections and plant as usual. Make sure each section has at least one leaf and healthy roots. How Big Do Anthuriums Grow? Depending on the particular cultivar (variety) and when grown in preferred conditions, anthuriums grow anywhere from 2 to 3 feet tall and wide at maturity. Anthuriums are considered to have a relatively slow rate of growth and can take a year or more to achieve their mature size. If the spadix in the center of the anthurium flower is pollinated, it eventually develops small clusters of red berry-like fruits. Will An Anthurium Grow In My Bathroom? Provided you bathroom gets adequate light, an anthurium grows quite well in a bathroom due to the levels of humidity. How Long Do Anthuriums Live? If you properly care for your indoor anthurium, you should be able to enjoy its tropical lushness and exotic flowers for many years. What Color Are Anthurium Flowers? Once upon a time, you mainly saw anthuriums (flamingo flower) in shades of red, but you can now find varieties producing pink, white and salmon flowers. Are Anthuriums Poisonous To People And Pets? Anthuriums contain calcium oxylate crystals, which are toxic to people, cats and dogs, so keep your plant out of the reach of curious pets and children. Ingesting the substance causes irritation to the mucus membranes and G.I. tract. Why Isn’t My Anthurium Growing? Unless it’s winter, when anthuriums go into dormancy and stop growing until weather warms in spring, the problem with an otherwise healthy looking anthurium not putting on proper growth is more than likely due to the plant not being happy with some of its growing conditions. The number one reason might be it’s not getting enough light. Anthuriums grow best situated in an indoor location receiving bright to medium levels of light. You can also make sure it’s getting enough nutrition by fertilizing with a water-soluble, houseplant blend applied at a half-strength every two months. Why Do Anthurium Leaves Turn Yellow? If your anthurium’s leaves begin yellowing, which eventually encompasses the entire leaf, you might be overwatering. Stick your finger into the soil and if it’s wet and soggy feeling, wait until the top inch becomes dry before watering again. When it comes to anthuriums, it’s better to underwater than use too much too frequently. Only water when the top inch of potting mix feels dry to the touch and then apply until it runs from the pot’s bottom drain holes. Why Are My Anthurium Leaves Turning Brown? If the tips of your anthurium’s leaves are turning brown and the condition seems to grow, more than likely you are keeping the soil too dry. Stick your finger into the soil and if it’s dry apply water until it runs from the container’s bottom drain holes. Fix the problem by watering your anthurium on an appropriate schedule of applying water when the top inch of soil feels dry. This will more than likely mean you will need to water about once weekly during the growing season, and about every other week during winter. Since the brown will remain on the affected leaves even after you’ve corrected the irrigation problem, you can trim off the browned sections with clean pruning snips. Why Are My Anthurium Leaves Losing Their Shine? If your anthurium’s foliage starts losing its glossy shine and changes to a dull, flat green, the plant isn’t receiving enough humidity. Remember, in their natural habitat, anthuriums are jungle plants living in a humid environment. You can easily correct the problem by increasing the humidity around the plant by misting it with water several times each week, or sitting the pot on a tray of pebbles that hold the water running out of the bottom drain holes. Why Have Some Of My Anthurium’s Leaves Lost Their Color In The Center And Have Brown Tips? If your anthurium’s leaves start having bleached centers along with brown leaf tips, this is usually a problem of the light conditions being too bright. Numerous dry brown patches on the leaves are often a sign of sunburn. When checking its location you will probably find it’s receiving direct light instead of bright, indirect light. Sometimes the bottom leaves of your anthurium will develop brown tips and lose their deep green color. If you know it’s getting adequate light and you aren’t overwatering, your plant might be suffering from too much fertilizer. As you can probably guess, you need to cut back on the amount and frequency of fertilizer applications. Your anthurium will thrive with every other month applications of a water-soluble houseplant fertilizer applied at half-strength. 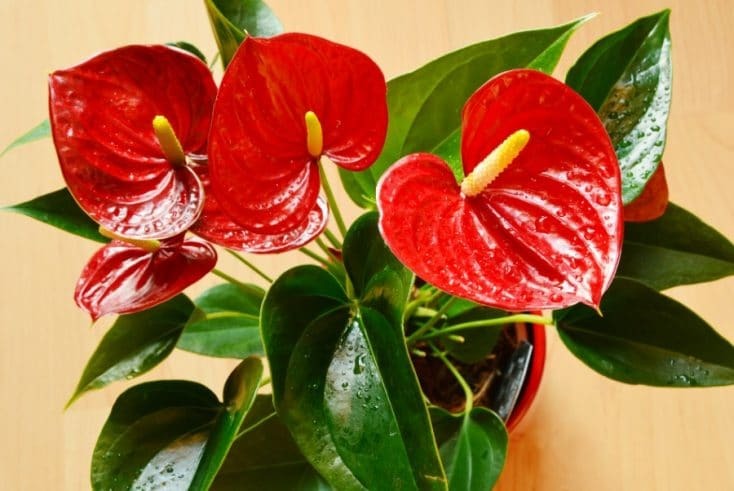 The best course of action for your affected anthurium is to take the container to the sink and slowly flush the soil with water, removing any salt buildup. Let the water run gently through the soil for about five minutes and then carefully remove the anthurium from the pot and inspect the roots for damage. Carefully snip off any damaged or dead sections with clean pruning tools and replant the anthurium back in the pot. If you notice areas around the base of your anthurium turning black and getting mushy, this should raise alarm bells as it’s often a sign of root rot. You may also notice the older foliage losing its rich green color, turning more yellow, and the entire plant may be wilting. If large areas of the plant are quickly developing black rot, you more than likely can’t save the anthurium, but if only a small section is affected, you can take quick steps to salvage a portion of the plant. Gently remove the anthurium from its container, shaking off excess soil, and inspect the roots for rot. Trim off the infected section with sterilized pruning tools. Wash the container with soapy water before refilling it with a clean, well-drained potting mix and replant the anthurium at the same depth it was originally growing. Repotting in a soil that is too heavy and doesn’t drain well will only lead to the problem reoccurring. Hold off watering the newly potted anthurium for several days and then resume watering when only the top inch of soil feels dry to the touch. It is easy to identify if you have a problem with spider mites on your anthurium. When you gently shake the plant if you see tiny, white flying insects hovering around the anthurium, you have got yourself a spider mite problem. Spider mites are common to indoor anthuriums grown in too wet conditions. Cut back on watering, irrigating only when the top inch of soil becomes dry, to assist the soil in becoming dryer. Spider mites are sap-suckers and can quickly damage your anthurium and also travel to your other indoor plants, so you need to treat the problem quickly. Using an insecticidal soap, saturate all areas of the plant, reapplying weekly or as recommended on the product label. Aphids are another sap-sucking insect that can infect anthuriums grown in too wet conditions. The tiny, pear-shaped insects come in a host of different colors and cling in mass groups along the underside of the leaves and along the fresh, new stems. They too can infest your other indoor plants if the problem isn’t treated. Treat the aphids with an insecticidal soap, saturating all areas of the anthurium, including the underside of the leaves and reapplying weekly or as recommended on the product label. You can also try wiping them off with a damp cloth dipped in water. Only water your anthurium when the top inch of soil becomes dry. Mealybugs are another sap-sucking pest that are easy to identify and are common pests in excessively wet conditions indoors. The insects form into cottony masses along the leaves and fresh, new growth. Like spider mites and aphids, mealybugs can also infest your other indoor plants if they aren’t treated. Use an insecticidal soap to saturate all areas of the anthurium, and reapply weekly or as recommended on the product label. Reduce watering to only when the top inch of soil becomes dry. You have a problem with bacterial blight if you notice your anthurium’s leaves developing yellowish, water-soaked lesions that quickly turn to brownish-black and die. The blight is most problematic when humidity is high and nighttime temperatures are high. It is essential to prune the affected foliage from the plant with sterilized pruning tools. 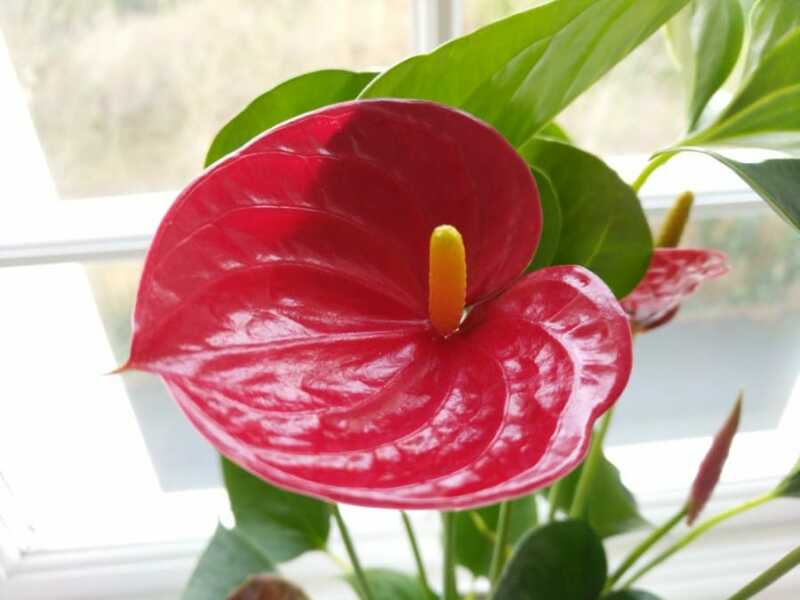 You can control further outbreaks by lowering the humidity levels and indoor temperature, as well as making sure there is good air circulation around the anthurium and applying water only to the soil, keeping it off the foliage. 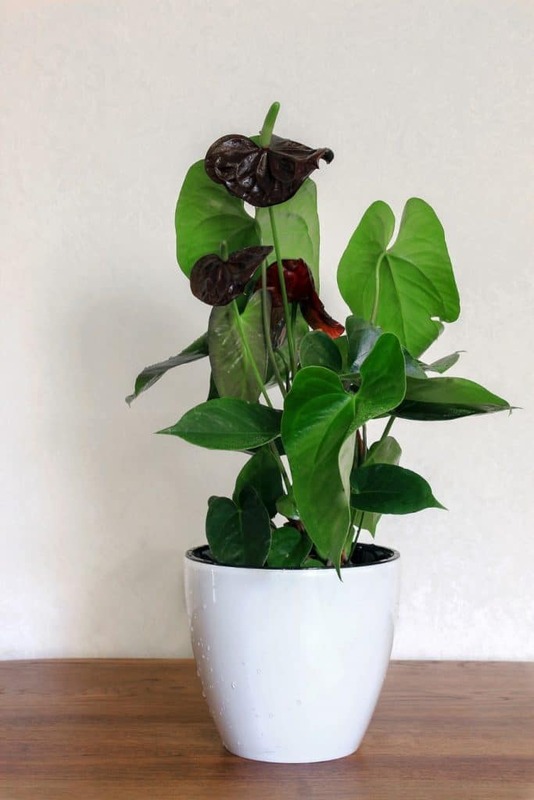 If you notice the leaf veins on your anthurium yellowing and then the entire leaf changes to a brownish-bronze color and although the plant is receiving enough water it’s wilting, you have a problem with bacterial wilt. 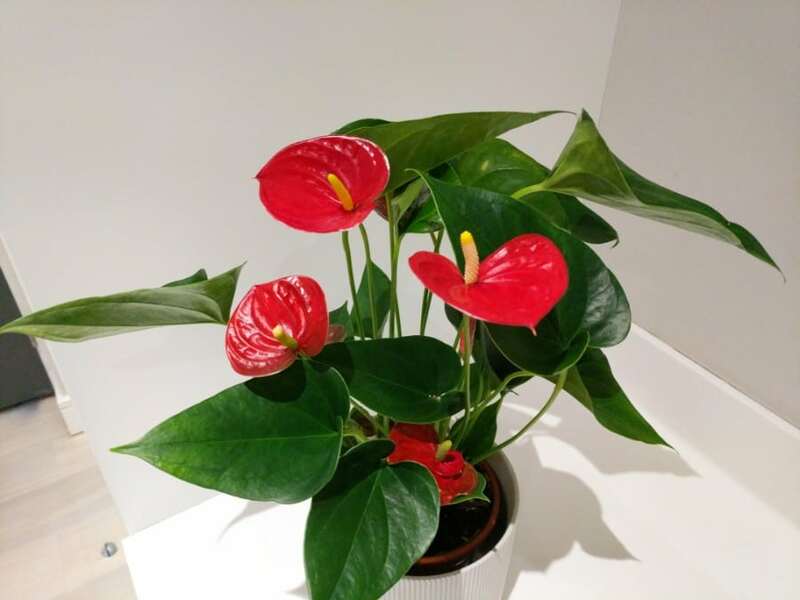 Using unsanitary tools, containers and soil is the usual cause of this problem and when indoor conditions are cool, the anthurium might not show signs of the bacterial wilt until conditions warm. 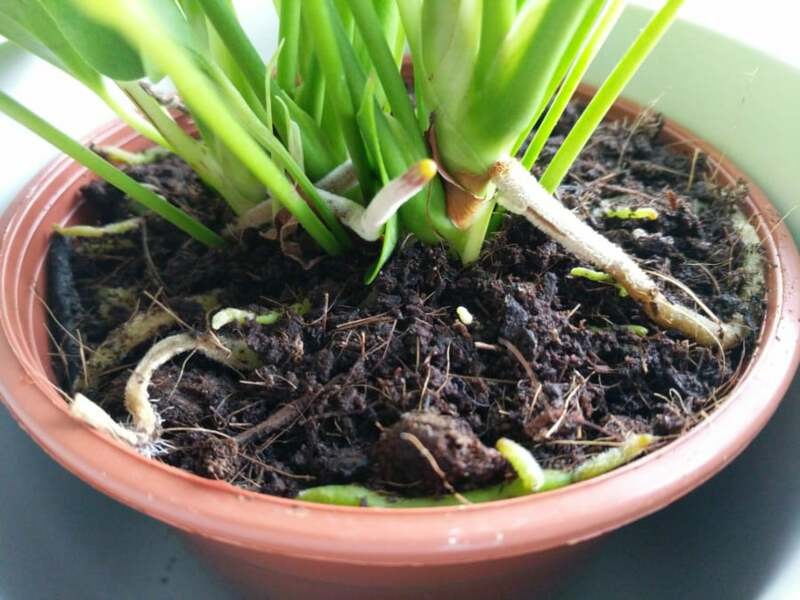 The best course of preventing this problem is making sure you only use fresh, clean soil when repotting, as well as clean containers and sterilized tools. Keep the area around the plant clean by removing any dead and dropped foliage or debris. Dear Andrew, thank you so much for sharing your advise over plants world. my Anthurium is nearly leaveless but still blooming I recived it an year ago and I suppose it’s not planted in acid soil. I’m planning to change the soil. What else can I do to help that great plant? Thank you in advance for your precious advice. Hi Cristina, thanks for asking this question. I think my best advice to revive your anthurium would be to optimize a few key things about its care to make it easy for it to recover. Make sure it is located in bright light, as this will give your plant energy to produce new vegetation. Even a few hours of direct sunlight in the early morning can be tolerated. Keep your anthurium away from drafts, as this can really cause them to suffer. Ensure you are not overwatering your plant. It’s really easy to do, and root rot can set in easily. Try to inspect the roots either through the drainage holes, or by carefully lifting the plant and potting soil out of the pot, to take a look. It the roots look healthy, I wouldn’t be inclined to repot it when it is already struggling. However, if there is any sign of root rot, it is essential to repot it and remove the affected roots, before repotting in a really well draining potting medium.